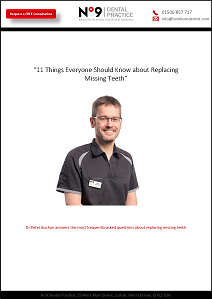 Implants are the most predictable long-term solution to missing teeth. This is true whether you are missing one, two, or have no teeth left. Tooth implants fuse with the bone under your gums to form a strong and reliable foundation onto which we can build natural –looking crowns, bridges or dentures as a replacement tooth/teeth. If you would like the best dental treatment that is a permanent solution to missing teeth in the West Lothian area then this could be the ideal treatment for you. What are the advantages and disadvantages of teeth implants? Missing teeth can be heartbreaking, whether they have been lost young in an accident, or when older through wear and tear. Implant treatment can bring back the ability to chew you may have lost, as well as the confidence to smile. Why do dentists like dental implants? Dentists like tooth implants as they are often the closest thing to natural teeth. Removable dentures/false teeth can often be problematic for standing teeth and gums, even though they cost less at the beginning. Implants tend to support the bone at the implant site, this is particularly useful when replacing a single tooth as it keeps the natural contour of the gum line. Successful implants can be made to look and feel like natural teeth, assuming you take care of them and maintain your oral health. More information on this dental information site. By using the most modern dental equipment and techniques it is possible to have relatively minimally invasive implant surgery. The private dental care at our practice is provided by Dr Peter Buchan, a multi-award-winning dentist in a multi-award-winning practice. Dental Implants are a long-term investment and so cost more than many of our other treatments. Statistics show that because they last for so long they are often more cost-effective than a mixture of root canal treatments, crowns, bridges and dentures. We will let you know the cost of you individual treatment, as well as any alternatives. How do we complete the treatment? Implants are placed in the surgery and then usually left for around 8 weeks so that your healthy bone can grow around them to keep them securely in place. We can then build your new teeth on top of them. How long will getting dental implants take? You can have same day dental implants, when the implants are placed and immediately afterwards a tooth or teeth are placed. For many people, this is incredibly attractive. It can be the best way for some. It is still more predictable if there is time between the implant placement and the restoration being attached on top. Done this way the time taken will be around 12 weeks. The dentist will discuss the best way forward for you depending on your health, commitments and circumstances. If you need to have some form of implant surgery, example bone grafting then the process can take a little longer. How long will same day implants take? While placing implants is a surgical procedure none of our patients have experienced any pain during treatment. They will often expect pain afterwards, similar to having a tooth removed. However very few have any pain afterwards. We usually call patients day after surgery to follow up how they are doing. Nearly all of them comment how little discomfort they have felt. Will getting same day implants hurt? While placing implants is a surgical procedure none of our patients has experienced any pain during treatment. You may have some swelling and tenderness afterwards. Peter who places our implants is a gentle and neat surgeon, who will work in a way to minimise any discomfort afterwards as much as is possible.